To many people, white chocolate is a lesser chocolate. Its sweetness is almost cloying, and it doesn't have the rich, nuanced flavor that dark and milk chocolate have. The stuff that's extracted from a cocoa bean to make chocolate is called a chocolate nib. The nibs are ground into a paste, which is called “chocolate liquor” even though there’s no alcohol involved (another chocolatey lie!). The chocolate liquor can be separated into two parts: cocoa solids, which is where we get that delicious chocolate flavor, and cocoa fats, better known as cocoa butter. 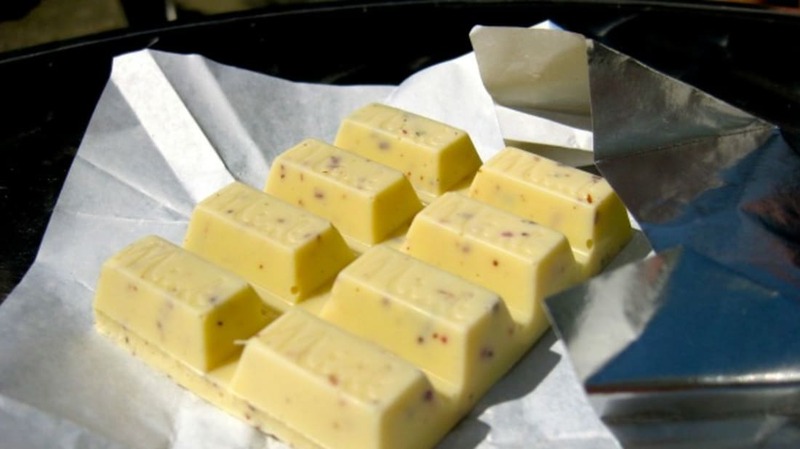 White chocolate doesn’t contain any cocoa solids. Though one of its major ingredients is cocoa butter, the substance lacks any flavor, which is essentially how we define something as chocolate. What's more, the FDA only requires white chocolate, which it deems a "solid or semiplastic food," to have 20 percent cocoa fat—so something that is legally labeled "white chocolate" may only contain 20 percent of a flavorless product derived from cocoa beans. The rest is made up of sweeteners, dairy product, emulsifying agents, spices, flavorings, and whey.